Previous posts on the Report are here, here and here. This post looks at Chapters 8 to 10 of the report. The powers are principally, but not exclusively, in Clause 7 to 9 -Dealing with deficiencies arising from withdrawal (Clause 7); Complying with international obligations (Clause 8) and Implementing the withdrawal agreement (Clause 9). There is also Clause 17 - Consequential and transitional provision. Here is a clause which is both subjective ("as the Minister considers") and wide "appropriate." The report recommends amendment of the Bill in line with the Sanctions and Anti-Money Laundering Bill to provide that, while the power remains available when Ministers consider it "appropriate", they must demonstrate that there are "good reasons" for its use and can show that the use of the power is "a reasonable course of action." - para. 167. Clause 7(2) elaborates on the types of "deficiencies" the power is intended to address. Clause 7(3) states that anything similar to the list in 7(2) may count as a deficiency and allows Ministers to describe or provide for additional deficiencies by regulation. Clause 7(3) begins - "There is also a deficiency in retained EU law where the Minister considers that there is - ..." and the report expresses concern that applying a subjective test of "appropriateness" to a broad term like "deficiency" makes the regulation-making power in Clause 7(1) potentially open-ended. This concern would be partially addressed if the Bill were to be amended to require Ministers to show "good reasons" to use the power and that it is "a reasonable course of action." Clause 7(7) places some restrictions on the use of the power in 7(1) - e.g. regulations under subsection (1) may not - (a) impose or increase taxation, (b) make retrospective provision, (c) create a relevant criminal offence etc. Although such restrictions appear in the Bill, there was concern that Clause 7(1) might be used to make policy changes as opposed to correcting deficiencies in retained EU law. Th report makes a recommendation that the powers be more tightly circumscribed on the face of the Bill so that they do not allow for major policy changes to be effected by them - see paras. 184 and 211. A further complaint about Clause 7(1) is that it is a "potentially expansive Henry VIII power" allowing for legal changes that would usually require primary legislation - e.g. creating public authorities. The committee recognised that the government will require some Henry VIII powers (para 188) but they must not be granted lightly and they require "commensurate safeguards and levels of scrutiny." Here is a further Henry VIII power but the committee noted that it is more clearly targeted (para 190) and may be justified given the degree to which the UK's international obligations will change as a result of Brexit (para 191). Again, the committee recommends amendment to require Ministers to show "good reasons" to use the power and that it is "a reasonable course of action." This clause was amended in the House of Commons so that it could not be used before the prior enactment of a statute by Parliament approving the final terms of withdrawal of the UK from the EU. The government has committed to introducing an Implementation Bill to legislate for the outcome of the negotiations with the EU. Given the government's plans to have an Implementation Bill, it seems pointless retaining Clause 9 and the report recommends its removal from the Bill (Clause 197). In any event, Clause 9 (if enacted) would expire on exit day - Clause 9(4). Sunset Clauses apply to Clauses 7-9. Two years for Clauses 7 and 8 and "exit day" for Clause 9. The committee welcomes those provisions but notes that they do not resolve the other problems with the powers. Clause 17 is a further Henry VIII power to make consequential and transitional provision but which has the potential to be used beyond what is ordinarily understood to be consequential / transitional. Whilst agreeing that the government may require a power to make "transitional, transitory and saving provisions" the committee recommended that the power to make "consequential provisions" in Clause 17 be removed. It is not particularly clear to me where the report leaves Clause 17. A redraft of the entire clause appears to be required if the committee's recommendation is to be met. Effective parliamentary scrutiny of the extensive regulation-making powers in the Bill is essential. Parliament must ensure that the information provided alongside the regulations allows for proper scrutiny and that the procedures the regulations will be subject to are appropriate. The committee welcomed requirements in the Bill for publishing explanatory memoranda for instruments resulting from the Bill - see paras. 208 to 211. The government wishes to use NEGATIVE procedure for most instruments to be made under powers in the Bill - (para 214). The Committee states at 215 - "We do not consider that it is appropriate for the Henry VIII powers in this Bill to be exercisable by the negative procedure, particularly as they might be used to make legislation of substantive policy significance. The Government has not offered sufficient justification for the widespread application of the negative procedure in this context, given the constitutional implications for the separation of powers." AFFIRMATIVE procedure would apply in only a limited number of situations - see Schedule 7 Part 1. Examples include establishing a new public authority in the UK; transferring functions to a newly created public authority; etc. The committee expresses concern at the limited range of matters to be subject to affirmative resolution procedure and calls for affirmative procedure to be used for any measure which involves the making of policy (para 219). There is concern about the power in the Bill (Schedule 7 para 3) enabling Ministers to bypass affirmative resolution procedure in urgent cases. The committee was not convinced that urgent-case procedures are acceptable and the process needs to be far more tightly drawn and controlled (para 222). Chapter 9 concludes with discussion of "Additional Committee Scrutiny" (paras 223 to 228) and The Role of the House of Lords (229-233). The government expects around 800-1000 statutory instruments to flow from the Bill and time will be very limited. There has been a commitment by the Leader of the House of Lords to enhance the resources available for scrutiny. A key factor in Brexit is that many competencies exercised by the EU will flow back to the UK but not necessarily to the Devolved governments. A vital issue is how these competencies will be handled post-Brexit. Naturally enough, the devolved governments do not wish to lose powers which they already exercise (e.g. in relation to Scottish fisheries etc). The Government has produced a list of the existing EU competences that interact with the devolved settlements, to inform discussions about common frameworks. It identifies 111 areas for Scotland, 64 for Wales and an estimated 149 for Northern Ireland. The Summary section in the report states - "The Bill also has significant consequences for the devolved administrations and their relationship with the UK Government. The Bill envisages the transfer of competences from the EU level to the UK Government but does not provide clarity and certainty as to which powers will then be devolved and on what timescale. That some of these powers fall within areas of existing devolved competence has raised concerns in the devolved administrations, which makes it essential that inter-governmental relations on the Bill are conducted effectively. The UK Government urgently needs to secure political agreement with the devolved administrations in order to achieve legislative consent from the respective legislatures for the Bill. A failure to secure legislative consent would not legally prevent the Bill from being enacted, but it would have significant constitutional repercussions. In addition, we consider that the Bill poses specific challenges for Northern Ireland, as no executive is currently in operation in Stormont and no Assembly is convened to give its consent." "The Bill addresses devolution in two main ways. Clause 10 and schedule 2 confer on the devolved administrations power to make regulations which correspond to the powers conferred on UK ministers by clauses 7 to 9. The schedule 2 powers are however “shared” with UK ministers. Clause 11 restricts the powers of devolved institutions in relation to retained EU law, giving determining power to UK ministers and providing for joint decision making in certain situations. The report states - "The primary concern we have in this process is that the devolution settlements must not be undermined. We welcome the discussions that are currently taking place between the UK government and the devolved administrations to seek consensus on the approach of the Bill to meeting the challenges posed by Brexit." At paras 236 to 240, the report sets out the effect of Clause 10 (and Schedule 2). Clause 11 is explained at paras. 241 to 242. Clause 10 gives effect to Schedule 2 which confers powers to make regulations involving devolved authorities which correspond to the powers conferred by sections 7 to 9. Clause 11 amends devolution legislation - e.g. the Scotland Act 1998 section 29. Thus, section 29 would be amended so that, with some exceptions, an Act of the Scottish Parliament cannot modify, or confer power by subordinate legislation to modify, retained EU law. Considerable concern exists over these powers which are seen by some as a formal recentralisation of power - (para 244). Clause 11 was seen by the Finance and Constitution Committee of the Scottish Parliament as a "fundamental shift in the structure of devolution in Scotland" (para 247). In the House of Commons the government stated that amendments to Clause 11 would be introduced but these are still awaited. The Government’s principal policy objective, in connection with clauses 10 and 11, is to identify areas which need a common approach across the UK and then to release areas of competence “where it is agreed that a common approach established by EU law does not need to be maintained and can be changed (para 251). At para 260 the committee states that "agreement of common frameworks is essential to ensure that those areas that are currently governed by EU law return to the UK in a way that both maintains a common UK approach where needed and respects the principles of the territorial constitution. Securing such agreement will also help assuage concerns over the possible ramifications of clause 11 and may help secure legislative consent to the Bill by the devolved legislatures. It is important that all parties to the negotiations have similar incentives and work constructively to reach an agreement on the approach to common frameworks. We urge the UK Government and the devolved administrations to seek swift and tangible progress towards such frameworks in their negotiations." The UK Parliament does not normally legislate on matters that are within the legislative competencies of the Scottish Parliament, the National Assembly for Wales or the Northern Ireland Assembly without the consent of the relevant legislature. At para 271 the report states - "The constitutional consequences of proceeding with the Bill without legislative consent from the devolved legislatures would be significant and potentially damaging, both to the UK’s withdrawal from the European Union and to the union of the United Kingdom. It is imperative that the Government brings forward amendments to clause 11 and works through the Joint Ministerial Committee to ensure an agreed approach to the return of competences from Brussels and pan-UK agreement on common frameworks." "The implications of the UK’s departure from the European Union for Northern Ireland, given their complexity and sensitivity, require special and urgent consideration by the Government. 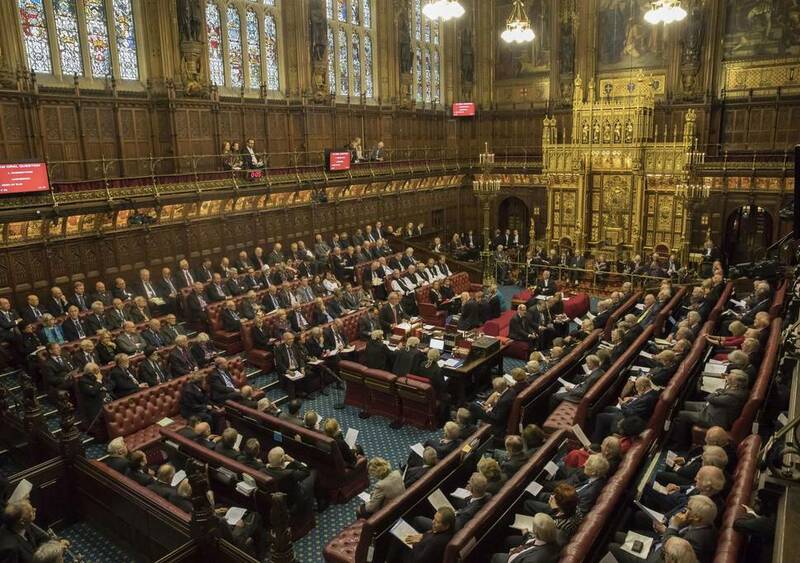 consideration in the House of Lords."